At 3 pm it wasn’t snowing. It was bright and clear but pretty cold. I went downstairs to get a coffee at about 3.20 and it definitely was then. It started getting heavier so I nipped up to my bedroom with the camera to get this photo. Click through and there’s one on the other side on Flickr. I didn’t want to open the window too far because it was blowing in. 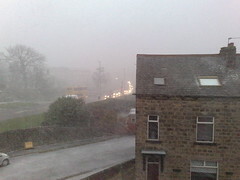 By 4 pm it had stopped temporarily, but it was snowing again when I left to go to the gym just after 5.